Maxthon Android Web Browser – Soft for Android 2018 – Free download. Maxthon Android Web Browser – New take on the old browser for Android. Maxthon Mobile - the reincarnation of the once very popular and powerful browser, which a few years ago seriously lost ground in the PC market was almost completely reoriented to users of the operating system Android. During the download and installation Maxton-browser on your smartphone, I just tuned in very skeptical, as the screenshots in Google Play, I expected that here I certainly did not surprise me. I was wrong. The first thing you notice when you start Maxton, - this beautiful square icons sites that does not take up much space as similar to the Quick Access at Dolphin Browser and Firefox . 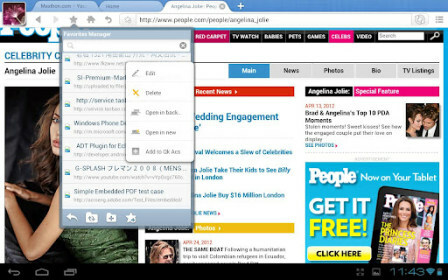 You can place a 16 tabs at once, and you can not only refer to the site, but also downloaded the. Most of all I liked the implementation of full-screen mode, in which the top line of the tabs can be pulled down gesture from the top of the display. At the same time, together with gestures, full-screen mode to instantly get used to. Gestures in the application, of course, are not as elegant as in UC Browser , but still noteworthy. For example, to switch between tabs, you need to run your finger up and right / left. Also, the simple gestures of the left and right buttons replaced back and forth. But for the closing and opening new tabs gesture was not, and sorry. About the download speed is nothing good I can not say, but too bad. Works does about the same rate as Google Chrome . With Flash-eating does "friends" and understands it in all cases. True, I recommend disabling it, since it is the main killer of the battery and catalyst brakes and locked up. In the settings, by the way, you can set the flash to manual operation clique. A special service of Maxton Passport can sync all your bookmarks in the cloud, though it will have to install a special extension and import your bookmarks on your computer. Certainly, many will appreciate the ability to change design and Tweaking visual browser features. Of course, in my opinion, all of these topics, except the standard design, looks messy, but it's a plus. Also, the browser supports the installation of extensions, which the built-in directory of 7 pieces, and the benefits are very questionable. Maxton - a convenient and functional browser for Android with lots of options and interface customization. Serious deficiencies had not, but the "killer features" that would make it unique, I also have been found.